Earl Haig (1861-1928), the high-profile military leader and co-founder of the British Legion, was born in Edinburgh and celebrated there even before his death: this statue was an Edinburgh landmark for over 85 years. But it was removed early this year to facilitate access to and spectator space for the Edinburgh Tattoo, a spectacular military display held annually on the Esplanade. The statue is now being restored prior to relocation. It will stand within the castle grounds, near the National War Museum. Haig is a controversial figure, especially because of his leadership at the Somme. The statue too has been the subject of some controversy. 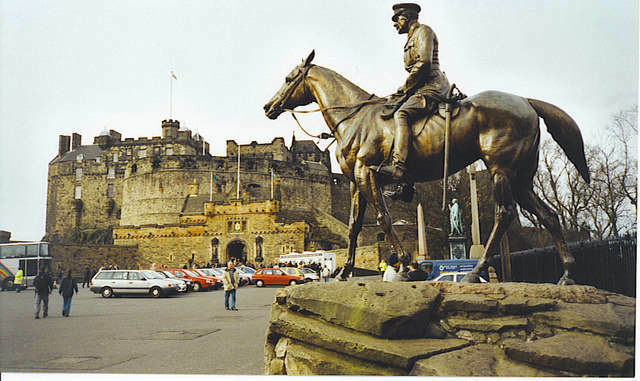 When it was proposed as a suitable inspiration for a similar tribute in London, Adrian Jones wrote in a "veiled reference" to it: "some sculptors attempt to copy nature direct, and that from a half-rationed horse, with the rider sitting as though a puff of wind would blow him off" (qtd. in Watkins 15). Lionel Earle, Secretary to the Office of Works in London, also objected, calling it "a dreadful production, although it is in many ways like him" (qtd. in Watkins 17). Wade was perfectly capable of depicting a well-covered horse, as a model of one in in his studio shows, so it seems that he was indeed trying for greater realism here. But perhaps that was unwise in such a monument. The horse's legs are awkwardly splayed, especially from the front, and Haig looks uncomfortable in the saddle; the ensemble as a whole is rather strained. In the past, much was gained by seeing it against such a dramatic backdrop, but presumably that advantage will now be lost. The days of equestrian statues of heroes were numbered by this stage. 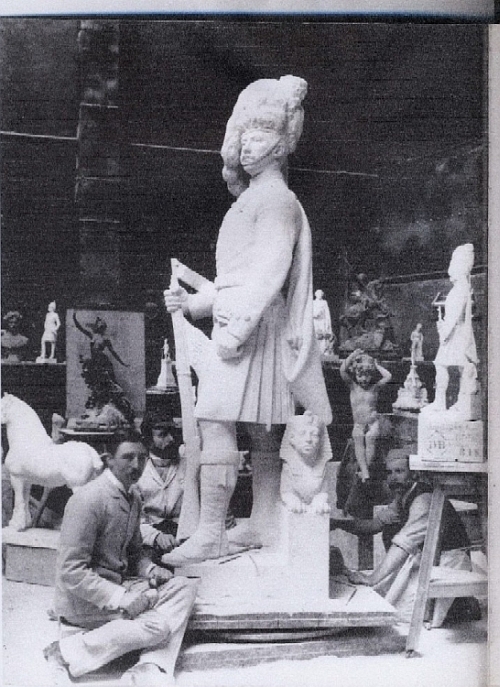 After two earlier versions had been rejected, Alfred Hardiman's statue of Haig was finally unveiled in Whitehall in 1937; it proved to be the last of its kind (see Watkins 25). Copyright by Colin Smith at Geograph, and licensed for reuse under the Creative Commons Licence. Taken in 2002. Text by Jacqueline Banerjee. Earl Haig Memorial. Official Edinburgh Castle site. Web. 12 Dec. 2010. Watkins, Nicholas. "A Kick in the Teeth. The Equestrian Monument to 'Filed Marshall Earl Haig, Commander-in-Chief of the British Armies in France 1915-1918,' by Alfred Hardiman." Article reproduced on the Henry Moore Foundation site. Web. 12 Dec. 2010.